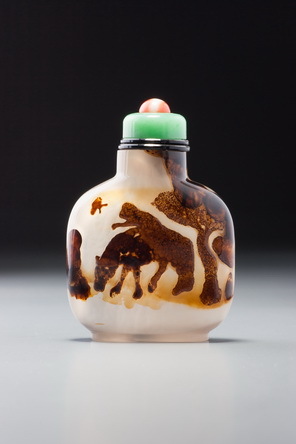 This rare olive-stone snuff bottle falls into the folk-art end of the range when judged by the standards of such masterpieces as Sale 1, lot 1, and Sale 4, lot 154, but because of its tiny size, it gets away with it admirably. 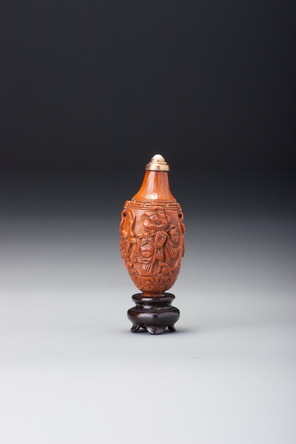 As a general rule, walnuts and peach stones seem to have attracted more artistic attention among miniature carvers of snuff bottles than olive stones. The workmanship here is not simply decorative, to be sure; the design is dynamic, and each of the immortals can be individually identified; but it remains folk art, produced by a craftsman making his tiny wares to a sufficient standard to carry their important symbolism adequately for the marketplace, but not pouring artistic heart and soul into the effort. Where he has exerted himself is in the formal quality of the work: he has gone to the trouble of carving a sensible snuff-bottle form rather than just carving and hollowing the shape of the original stone. This bottle has a well-defined tapering-cylindrical neck, a flat lip, and a protruding, neatly flared foot. The craftsman has also, astonishingly, felt it necessary to take the extra trouble to vary the mask-and-ring handles to provide a concealed access for a tiny cord in order to suspend it from something, maybe a belt, or perhaps more likely, to attach a tiny and therefore vulnerable stopper and spoon to the bottle so it would not be easily lost.